Happy Wednesday! 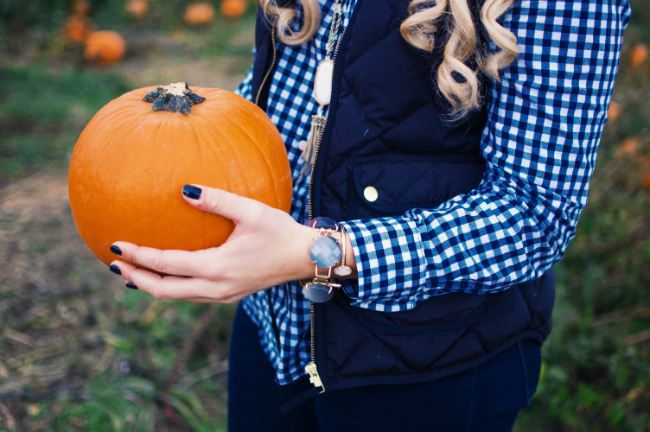 I'm really excited to share today's post with y'all!! It's all about partnering up with two wonderful friends and one of our favorite brands to give back to a charity that means so much to me! As many of you know (and for those of you that don't), I help coordinate one of the largest charity galas here in DC. Myself, along with around thirty other volunteers, plan Taste of the South Charity Gala. This gala is a long standing tradition in DC, and has raised hundreds of thousands of dollars for deserving charities across the South. Each spring we host a night of fun, food and a killer band, at The Washington Hilton Hotel. For those of you thinking this name rings a bell, you're probably right. This hotel is where many Inaugural Balls have been held, as well as the White House Correspondents dinner. One particular aspect of Taste of the South is that each year the committee chooses one Southern state to provide the overall featured charity. This particular state and charity receive the majority of the proceeds raised. This spring's gala is especially exciting for my home state of Tennessee, as our state's charity will be featured!! I'm really excited to raise money for our Knoxville based charity, The Camp Koinonia! Camp K is a week long camp hosted by University of Tennessee students and is for children with multiple disabilities. The camp provides these campers with the opportunity to escape the hardships of their day-to-day routines and have fun for a week. This charity is near and dear to my heart because I served as a camp counselor while I was in college! Now that you know a little background, I'm excited to share that I've teamed up with two of my favorite bloggers and one of our favorite brands, to host a night to give back!! Y'all know how much I love Kendra Scott, and one of the reasons I love this brand so much is that one of their main commitments is giving back! They've given millions of dollars to deserving charities all across the country, and next Wednesday, January 13th they're giving 20% of their evening sales to Taste of the South and Camp Koinonia!!!! How amazing is that?! So here are the details... if you're in the Washington, D.C. // Northern Virginia // Bethesda, Maryland areas, then you're in luck. 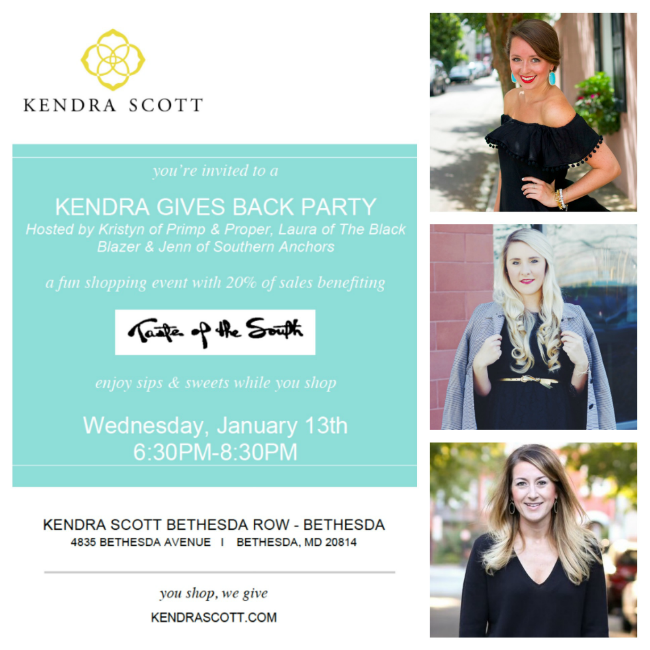 Myself, Laura of The Black Blazer and Jennifer of Southern Anchors, will be hosting the Kendra Scott Gives Back night at their Bethesda location. We'll have sips and sweets, and 20% of your purchase goes directly to Taste of the South! The fun starts at 6:30 p.m. and goes till 8:30 p.m. More details can be found below! I'm so excited to host my first in-store event with Laura and Jenn. They're two of my very best friends here in DC and fabulous bloggers. I also love how they have ties to Camp Koinonia and TN. Laura is from Tennessee as well, so I know she's super excited to raise money for her home state! Jenn went to Virginia Tech, which is where Camp K was actually founded almost 40 years ago!! I'm so glad that I can share this fun night of shopping with them, and YOU! We look forward to meeting and shopping with everyone next Wednesday! Love it girl, so excited for you! Wish I could come and give back with you all! How fun! Wish I wasn't so far and could make it for the event. Best of luck!! Me too!!! That would be so fun, BUT I'll be seeing you in a little over a month! EKKK, can't wait!